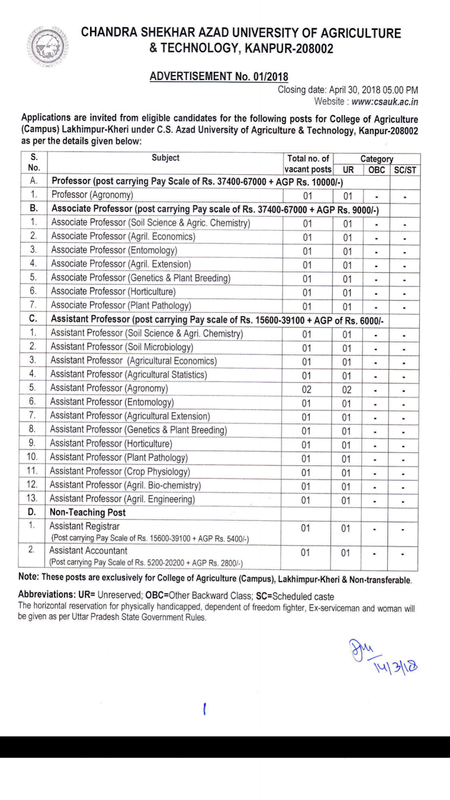 Applications are invited from eligible candidates for various posts in different cadres:Teaching Posts: (A) One post of Professor in Agronomy; (B) seven posts of Associate Professors- one each in soil science & Agricultural chemistry, Agricultural Economics, Entomology, Agricultural Extension, Genetics & plant Breeding, Horticulture and plant Pathology' (G) Fourteen posts of Assistant professors- one each in soil science & Agricultural chemistry, soil Microbiology, Agricultural Economics, Agricultural statistics, Entomology, Agricultural Extension, Genetics & plant Breeding, Horticulture, plant Pathology, crop Physiology, Agricultural Bio-chemistry, Agricultural Engineering and Two posts in Agronomy. Assistant Accountant. Details of requisite qualification, terms & conditions, processing fee, prescribed application proforma and scorecard may be downloaded from the university website:www.csauk.ac.in. Application on prescribed format must reach the Director, Administration & Monitoring through registered/speed post on or bq[ore April 30, 2018.